At last week’s Long Beach Motorcycle Show, one of the best looking bikes was a simple Cafe Racer introduced by Royal Enfield. The bike will be designated a 2014 model when it is introduced in the summer of 2013. The air-cooled single has been punched out to 535cc, and makes an additional 9 horsepower over the standard single-cylinder Royal Enfield models. It is also 47 pounds lighter, bringing claimed weight into the range of 360 pounds. The expected price is $7,295.00 in the U.S. market. Several accessories include a two-person seat and clubman bars. I want one! 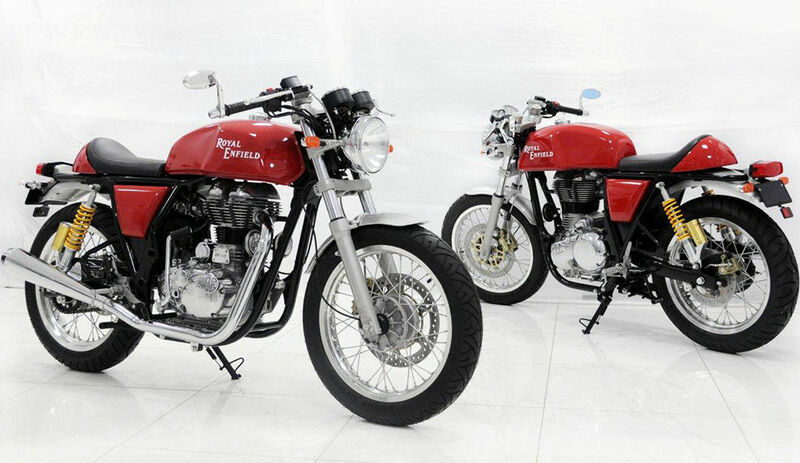 The video of the unveiling is worth watching for two reasons, including (1) the beautiful Cafe Racer can be seen from several different angles, and (2) the enthusiasm of the small U.S. Royal Enfield crew is easily sensed in the speaker’s voice. I have my deposit down on this beautiful machine. I can’t wait to see how it rides compared to my 2011 C-5 500 cc military! I like the cafe model, but I’d prefer it with standard bars.